An antidote to the craziness. We submitted this piece to The New York Times @nytimes as an Op-Ed letter seven days ago and have never heard from them. We are publishing it here so our voices can be heard regarding this topic. It was clever, and complete with eye-catching graphics and unusual fonts to draw the reader in. However, it lacked basic research to make it useful for those who interested in learning about funeral options. The premise of the article was, in a quirky way, to tell readers the reasons people might want to consider a “green” burial. What has been the problem with nearly all the stories and comments about green burial is that although they are touted as an up and coming way of disposing of human remains, the facts do not support the argument. This hype-driven alternative is the province of a small fringe group who make it difficult to distinguish between fact and fiction. You often read statistics that claim people are very interested in this type of disposition, but there is an astounding lack of reporting about what percentage of the general public is following through on this choice. If you ask funeral directors how often families select green burial, you will quickly find that this is not a trend at all. Although, funeral and disposition choices have changed over the years, clearly this is not a choice that is widely popular. Looking at this specific article (many other articles quote the same statistics and material) there is a comparison between traditional funeral costs versus green burial costs at $1,000 – $4,000 for the green burial option. This is an exaggeration. By calling cemeteries that offer “green” options you will find that the burial space alone may take up more than half of the $4,000. The Green Burial Council’s (greenburialcouncil.org) website provides lists of approved and certified green burial funeral homes and cemeteries. For example, if you look at the list of cemeteries near New York City, you will find that the closest one is Sleepy Hollow Cemetery, about one hour outside the city. This means that the deceased would need to be transported a long distance for burial (as is the case in many areas around the country where there is no green cemetery nearby), adding additional costs. The article goes on to look at the type of caskets and shrouds that can be used. Some green caskets are no less expensive than those typically used in funeral homes on a regular basis. A Google search for green caskets and shrouds reveals pages of listings. Memorials.com offers many varieties of green caskets on their website from woolen caskets starting at $1,297.00, up to $2,099.00 for a bamboo casket. kinkaraco.com has a variety of products for green burials. Shroud pages show items costing between $225.00 – $995.00. Bear in mind, these prices do not reflect the funeral home’s charges nor do they include the cemetery space. Combined, these costs can easily exceed $4,000. The article also mentions urns and a starred box advises that “…cremation isn’t so green. Cremating one body uses as much fuel as a 500+ mile road trip.” There is no reference for this comment (nor for any of the other items in this piece) so one can’t determine its accuracy. Flame-based cremation usage is at an all-time high and continues to be a very affordable method of disposition. And newer flame-based cremation units are much more efficient. Last year, Facultatieve Technologies, a manufacturer of cremators, introduced the FT USA v2 cremation retort which minimizes the burning of natural gas during the cremation process. Flameless and aqua cremations are considered more environmentally friendly, but since they are relatively new their availability is limited across the country. An exchange between the author and two workers at Fernwood Cemetery in Mill Valley, California, (fernwood.com) discuss interments with misguided humor. Of note is that Fernwood Cemetery, which bills itself as “one of the country’s first environmentally conscious cemeteries” is not on the list of Green Burial Council approved providers. What’s more, on their price list for ‘Natural Burial Options,’ the least expensive option is $6,700, far exceeding the article’s suggested cost of $1,000 to $4,000. These prices are just for the burial space and no other goods or services. In the end what does all of this mean for the consumer? We believe it means that while people may be curious about alternatives to tradition funerals that curiosity has not led to a greater demand for green burials. At a time when traditional funerals today are sometimes mocked and treated like vulgar, pagan rituals, the majority continue to find them normal and comforting. The funeral of President George H. W. Bush is a case in point. So, let’s validate the consumer’s choice by telling them that whatever they want for their final disposition is okay. Surely, each individual should have the type of final disposition — burial, cremation, entombment — that they want and can afford, and that includes adhering to time-honored rituals or trendy alternatives. Just don’t be taken in by the hype. Perhaps it’s a consequence of being on social media, but barely a day passes that I don’t read some nonsense article, post or tweet about funeral service. Shooting ashes into space, turning cremains into bullets (Seriously, With all the gun violence these days !? ), mushroom suits, and so much more fill pages. My colleagues who do not subscribe to social media (and there are many) are amused when I tell them what I’ve been reading. What’s more, my colleagues don’t recognize the names attached to these fanciful stories which seem aimed at turning funeral service into entertainment. Perhaps they are better off than I am, as seeing so much fake news about funeral service grows tiresome and demeans the serious work we do. For many years, I have worked side by side with dedicated funeral directors, many of whom were raised in funeral service families. In addition to coordinating meaningful funerals, we have painstakingly prepared remains for visitations. One of the things we were taught in mortuary school is that viewing of the remains “confirms the reality of death.” And indeed the first visitation is not an easy one. As Dr. Alan Wolfelt has said, “People tend to cry, even sob and wail at funerals because funerals force us to concentrate on the fact of the death and our feelings, often excruciatingly painful, about that death.” Still, despite the pain, we are almost always thanked by mourners, often through tears, for the opportunity to see a loved one for the last time. The feedback has been gratifying and convinced me that the work funeral directors do continues to be important. As two women who have had long and successful careers as funeral directors, we’ve been reading a lot about the demise of funeral service as we know it. Much to our dismay, newspapers, magazines and websites often highlight macabre and outre voices, for the sake of shock. Inexperienced, and sometimes unlicensed, individuals have become self-appointed experts, telling anyone who will listen that the traditional funeral is a thing of the past, replaced by a holy host of new ways to dispose of the dead. Not so! 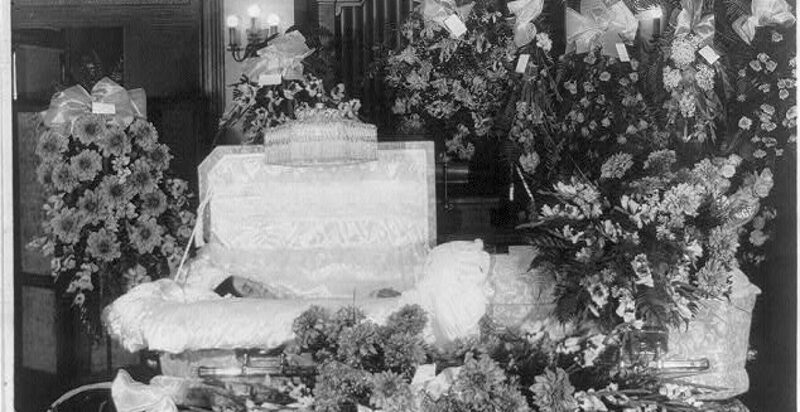 The time-honored funeral tradition, along with its many sacred rituals, is alive and well. We hope to be not only an antidote to all the misinformation out there, but also a resource for all who are seeking real information about all things funereal. Thanks for joining us as we explore this sensitive topic together. The Morte Girls Blog at WordPress.com.